It’s easy to miss the mezuzah when you enter the large room facing the street. The little parchment with the confession of faith in Hebrew is contained in a contemporary glass capsule that was inserted when the renovated Blue House was rededicated. When you enter the bright space and see the pictures on the walls you may guess the room’s original purpose. On the left wall hangs a large oil painting, based on a 1937 photo that shows the interior of the Breisach synagogue. It was painted by Phoebe Frank from California and donated to the Blue House. On November 10, 1938, the Jewish community was deprived of its house of worship – it’s synagogue, situated close to the community center in the “Judengasse.” An SS unit, with members from Freiburg and Breisach, violently launched the November Pogrom. All Jewish men between 16 and 60 were arrested, transported to Freiburg, and deported the next day to the Dachau concentration camp. Opposite the painting, two historical photos document the continuation of religious services in this room after November 10. 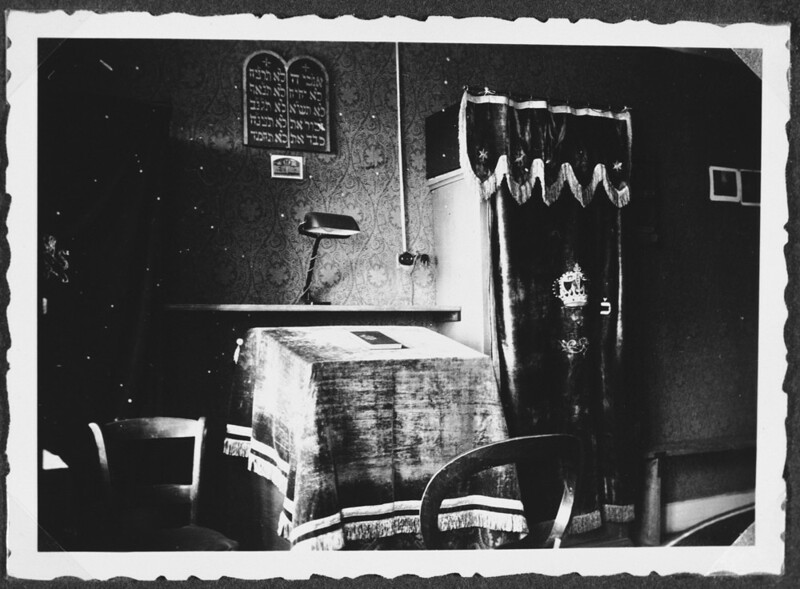 You can see a provisionary Torah Ark, a lectern and chairs for the community, and on the wall a board with the Ten Commandments. While their fathers were imprisoned in Dachau, boys who had completed their bar mitzvah – including Ralph Eisemann, the younger son of the cantor, and his friends – took over the task of leading services. Misrachim – Where is Jerusalem situated? Three misrachim (singular: misrach) on this wall with the inscription . מזרח. (Hebrew for East) indicate the direction “East.” Such an orientation for directing prayers towards the temple in Jerusalem could be found in every traditional Jewish household. One misrach comes from the legacy of Toni Keller nee Mock, whose parents ran the inn “Adler,” (eagle). She spent her final years in the Jewish old people’s home in Lengnau (Switzerland) after her exile in the USA. She is buried in the cemetery there. Another misrach was given to the Foerderverein in October 2000 by Albert Bochner, stepson of Theodor Guenzburger. Both of them survived the Shoah. The only misrach that withstood the time of the Nazis in Breisach is to be found in the small collection of the Blue House. Its owner was Selma Ziehler nee Bergheimer, who survived with her Catholic husband and her children, partly in Sulzburg. In this room, visitors learn about the Jewish families of Breisach, and their histories. There is an info sheet for each name in the hall of remembrance; often a photo as well. 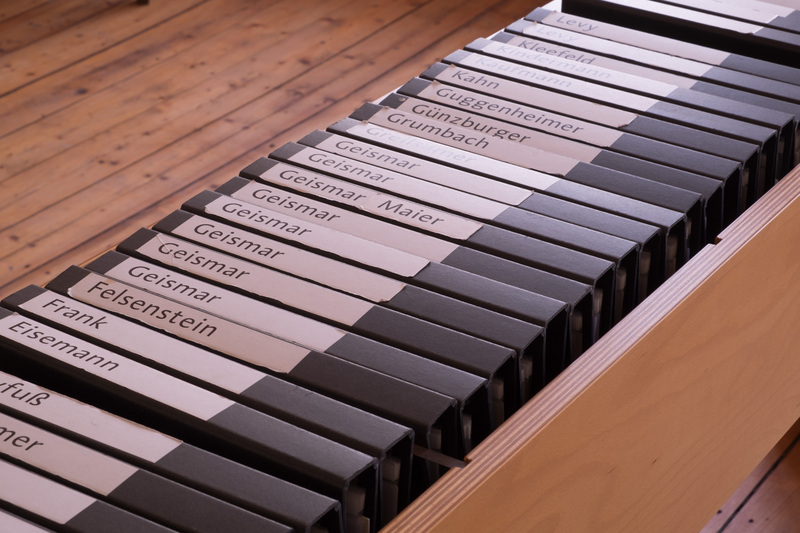 The position of the files – in the middle of the room – emphasizes the importance of the families and at the same time the loss. You are invited to leaf through the files, to investigate and ask.